Formed by a volcanic eruption in the sea over 100,000 years ago, Seongsan Ilchulbong Peak is located on the eastern end of Jeju Island, which is currently in the top 10 in polls for the New7Wonders of Nature. Upon discovering that Jeju Island had risen in the ranks as one of the top 10 locations vying for a spot as one of the New7Wonders of Nature, after checking the Web site on Sunday, Yang Gi-jeong of the World Natural Heritage Preservation Office in Yeon-dong, Jeju, let out a whoop of joy to alert his co-workers. With voting scheduled to end Friday, all eyes are fixed on Jeju. Voting ends on Friday at 8:11 p.m. and the results will be announced the following day by the New7Wonders Foundation. The competition was organized by the New7Wonders Foundation, a Swiss NGO that initiated the global poll in July 2007, and Jeju Island emerged in the 261st spot out of 440 locations in December 2008. 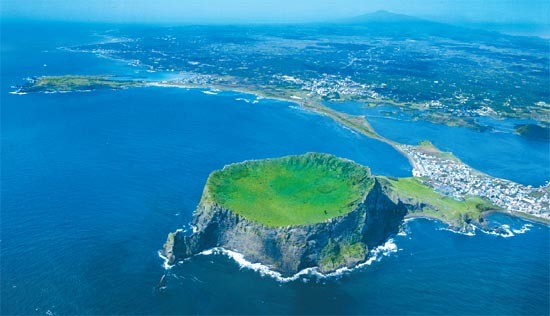 In July 2009, Jeju Island became one of 28 finalists and as of Sunday, Jeju Island is in the top 10. The other locations vying for the New7Wonders designation include the Grand Canyon in the United States, Halong Bay in Vietnam, the Jeita Grotto in Lebanon and the Great Barrier Reef in Australia. Most of these locations are already popular tourist destinations that are globally recognized and are also located in countries with large populations. For lesser-known areas such as Jeju Island, winning the designation is expected to boost tourism, and hotels and travel agencies are already gearing up to launch promotional campaigns should the southern island win. Jeju Island has been granted triple crowns in the natural and scientific fields by Unesco: It won designation as a Biosphere Reserve in 2002, induction to the World Natural Heritage List in 2007 and designation as a Global Geopark in 2010. It is especially known for its dormant volcanic mountain, Mount Halla, which is the tallest mountain in Korea. Previously, the foundation conducted a global poll in 2007 for the New7Wonders of the World in an attempt to update the Seven Ancient Wonders of the World. 6 일 오후 6시30분 제주시 연동의 세계자연유산관리단 사무실. 스위스의 뉴세븐원더스(New7 Wonders) 재단 홈페이지를 살펴보던 양기정 사무관의 입에서 탄성이 흘러나왔다. ‘세계 7대 자연경관’ 투표의 중간집계 결과 제주도가 상위 10위권에 포함된 것이다. 이 소식을 접한 강성후 세계자연유산관리단장의 얼굴에는 기쁨과 우려가 교차했다. 제주 외에도 그동안 각축을 벌여온 쟁쟁한 후보지들이 모두 ‘톱 10’에 이름을 올렸기 때문이다. ‘톱 10’ 명단에는 미국의 그랜드캐년과 베트남의 하롱베이 등 세계적 명소들이 대거 포함돼 치열한 경합을 예고했다. ‘7대 자연경관’ 선정이 이틀 앞으로 다가오면서 후보 지역의 막판 투표 경쟁이 달아오르고 있다. 정운찬 범국민추진위원장은 7일 대국민 호소문을 통해 전 국민이 투표에 참여해줄 것을 호소했다. 정 위원장은 “국민 1명이 한 번씩만 전화를 걸어도 5000만 표가 늘게 돼 7대 자연경관에 선정될 수 있다”고 강조했다. ‘7대 자연경관’ 투표는 11일 오후 8시11분에 종료된다. 선정 결과는 12일 오전 4시7분 뉴세븐원더스의 홈페이지(www.new7wonders.com)를 통해 발표된다. 현재 제주와 경합을 벌이는 곳은 이스라엘의 사해와 미국의 그랜드캐년, 호주의 그레이트 베리어 리프, 베트남 하롱베이, 레바논의 제이타 석회동굴 등이다. 제주는 세계 유일의 ‘유네스코 3관왕’이란 타이틀을 앞세워 7대 자연경관 선정 작업을 벌여왔다. 유네스코가 생물권보전지역(2002년)과 세계자연유산(2007년), 세계지질공원(2010년) 등 3대 자연과학 분야를 모두 인증한 곳은 제주가 유일하기 때문이다. 7대 자연경관으로 선정되면 관광객 증가 는 물론 국가 브랜드의 상승 등 여러 시너지 효과를 기대할 수 있다. 멕시코의 마야유적과 페루의 마추픽추가 2007년 뉴세븐원더스의 ‘세계 신(新)7대 불가사의’에 선정된 이후 관광객이 각각 75%, 70% 증가했다. 하지만 일각에선 민간기관인 뉴세븐원더스의 공신력에 의문을 제기하기도 한다. ◆‘세계 7대 자연경관’=전 세계인의 투표를 통해 세계에서 가장 아름다운 자연 경관지 7곳을 선정하는 프로젝트. 스위스의 비영리 재단 ‘뉴세븐원더스(The New7wonders)’가 주관한다.